← It’s October! What’s on your calendar? We’re excited! The citywide Seattle Emergency Communication Hubs have won the 2014 King County Executive’s Award for Community Preparedness! Previous winners include VashonBePrepared, the Renton Emergency Communications Services and the Carnation-Duvall Citizen Corps Council. As we’ve mentioned previously, there are now 50+ hub locations throughout Seattle. Our West Seattle Emergency Communication Hub network with its 12 hub locations is part of this citywide community-based effort. Want to learn more or get involved? The About the Hubs section of our website has useful maps as well as information. 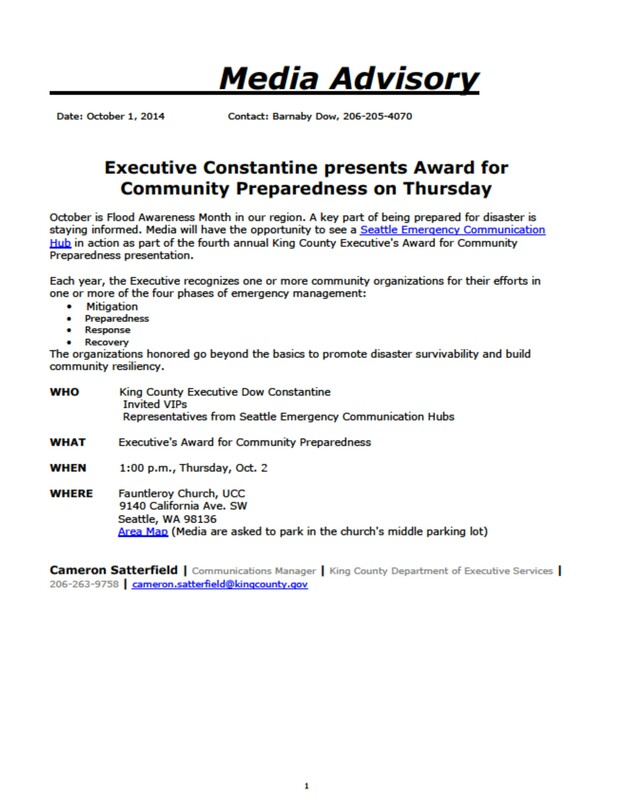 The award will be presented tomorrow, October 2nd, by King County Executive, Dow Constantine. It will be held at 1 PM in West Seattle at the Fauntleroy Church (where hub #8 is located). If you’d like to attend, you’ll find more details in the following press release. Added, 10/2/14: Here are links to coverage of the award presentation by the West Seattle Blog and the West Seattle Herald. This entry was posted in Announcements, Community Resources, Earthquake Preparedness, Events, West Seattle Be Prepared and tagged Award for Community Preparedness, King County Executive, Seattle Community Hubs, West Seattle Be Prepared, West Seattle Emergency Communication Hubs, West Seattle emergency preparedness. Bookmark the permalink.